Despite my ability to on occasion take pretty reasonable photographs, I have been taking great pleasure in reducing the quality, saturating the colours and generally creating images that look like tired old 1970’s and 80’s postcards. 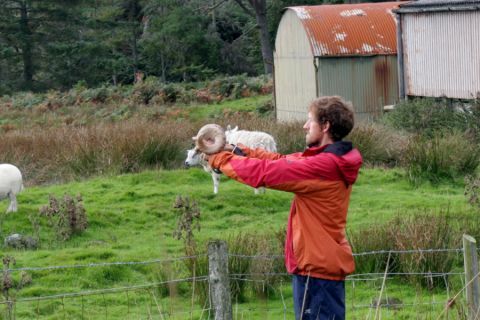 This current obsession is a bit quirky but I am really enjoying the unusual quality of the images, particularly in the recently uploaded “Sheep Pole” Swap Shop icon. In a secret act of covert art installation, I decorated an ancient standing stone out on the hillside with ribbons ; marking the seemingly ritualistic (but in fact mundane and habitual) behavioural movements of the island sheep. I did actually weave the ribbons in the time honoured fashion and tied it off in a huge bow at the base, but I think the image of the as yet untangled ribbons, the ‘potential’, is far more interesting and inviting an image than the completed act. I have completed the sorting in the Swap Shop (phew! ), and out of the couple of thousand items, nearly half had no traceable provenance, but the other half I identified as having been made in one of 45 countries world-wild, with only a handful of items coming from Scotland, and three handmade garments from Eigg. The list of “Made In” labels, for posterity, is as follows: Australia, Holland, Denmark, France, Belgium, Romania, Bulgaria, Hungary, Italy, Spain, Germany, Indonesia, Thailand, Sri Lanka, Tunisia, Bangladesh, Cambodia, Peru, Japan, Malaysia, Portugal, Vietnam, South Africa, Nepal, Morocco, Macau, Mauritius, Czechoslovakia, Pakistan, India, Philippines, Turkey, Greece, Singapore, Lithuania, Korea, United Arab Emirates, El Salvador, Taiwan, U.S.A, China, P.R.C. (People’s Republic of China), Hong Kong, Foreign, UK, Britain, England (a huge number of books from: St Ives) Ireland, Scotland, Nowhere. I am still interviewing islanders for the forthcoming audio walking guide, and questions have been raised about what connection the tourists (only ever referred to as ‘visitors’ on the island as a policy), or even islanders themselves- actually have with many of the landmarks. I have spoken to one or two islanders who have lived on Eigg for decades, who have never visited parts of the tiny island that visitors pass everyday! I am currently feeling the need to re-enact the island tradition of Guising (in photography at least) with costumes described to me by the 91 year old, and the islands oldest orriginal islander, Katie MacKinnon. Though she couldn’t remember a great deal of the details, Katie said that she and her brothers would go out, on Halloween in particular; “Yes Halloween. But there’s hardly anything like that going on now. I miss it. It’s great fun. I was out guising once a time. Ha Ha. I wore any rags I could get a hold of. A false face. A ribbon round the back.” So there you go. No images of such costumes exist, so I am going to have to take a few liberties and embellish a costume of my own. I have defined a clearer idea of the work I am undertaking in the swap shop now and I feel it might be good to place it here like a statement of intent: I want to juxtapose the swap shop (with its cultural discards) with ideas of cultural heritage, and a fledgeling tourism industry. The items from the swap shop represent the globalised contemporary islander, whose cultural identity (represented here by their personal possessions) may be influenced by hundreds of other cultures. Hence I am going to re-order the swap-shop to reflect the provenance of these items. This is no museum though, these objects: as ?swappable?, are positioned to be given away as- ?A Gift from Eigg?. And invites a new cultural object in it’s place as donation from the visitor. By ?branding? each item with a symbol of the island, whoever takes an item away with them will maintain the association between the object and Eigg (regardless of it’s original provenance). And in many ways these objects away in the world that I have ?branded?, could be seen as the ongoing artwork. This symbol (or set of symbols) will represent this ?gift? idea in the spirit of tourist paraphernalia, thus depicting the island as ?quaint? (meaning: attractive yet unusual or old fashioned). These images might come from views and landmarks I come across that meet the criteria, and might include some of my own inventions or mythologising about the place (I have an idea to create a May-pole for sheep, and re-enact the traditional Eigg Guising of which there is no photo record). The essence of the images will be banal but with oddness hidden amongst it and every now and then complete invention. On a separate note- It might also be interesting to create a sign for the swap shop (as it doesn’t have one) explaining how the swap shop works, encouraging visitors to add a sticker to the base of any new items as they become assimilated, and explaining the wider reaching effects of this process towards an ever more multicultural and globalised Eigg. I’m over two weeks into a six week residency now, and thankfully the interactions I am having with islanders are becoming more meaningful and productive. I was worried that I might loose momentum and I wondered to what extent I would actually want the islanders’ input to drive the work? Also I was initially worried I might make some faux pas that would get me tarred and feathered. Interestingly I have been talking about just such attitudes as this with several of my peers by phone (when the signal is able to bounce of the clouds at the correct angle/ time of day/ position of the moon or whatever). Is it possible that just such a conflict might produce a more interesting piece of work than something that could otherwise be seen as ‘straight’ or clear cut? I thoroughly enjoyed a presentation by Marcus Coates about a year ago, where he explained how a residency he had undertaken in which he created a large billboard, with a huge poster of himself in character, in the middle of a wood; led the local population to unite in burning it down, “It brought the community together in a beautiful and unusual way” he explained (I paraphrase). When someone looks at Eigg, perhaps, buys something from the gift shop, they aren’t just buying ‘’a gift from Eigg’‘. They are taking away all of the influences imbued upon that object. This taps-in really well to a chapter I wrote last year for an academic book on ’materiality’ (a PDF is available from www.museumcabinet.com). That London city guide printed in Singapore I mentioned in my last post, or the English language guide to Italy printed in Germany; perfectly represents the way multi-culturalism and globalism shape our perception of ourselves, and affect what we associate with a place. 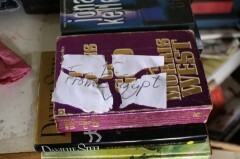 These guide books have become cultural artefacts ‘from Eigg’. Also, I really like the ‘gift’ ideology. 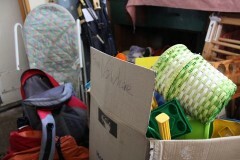 The swap shop exists because people don’t want to throw things away- (it’s an Eco sin!). 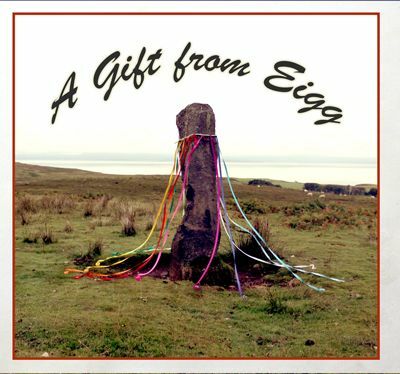 So “A Gift From Eigg” means: please take it away!- but it still exists as a cultural artefact of the island, as much as any tourist paraphenalia (probably more because it was once owned by an islander). I’m working on logo’s that can represent this over the next two weeks between interviews and I might start posting up prototypes as I go. Be good to use this blog as a source of feedback. One thing that is clear about undertaking a residency of this kind, is it never makes the list of options open to me any smaller the longer I am here. Rather than focusing in at this early stage; I feel as if I may be drowned in subtleties, interrelationships, and wholly new choices! It’s been a few weeks now since I landed on shore, and I have settled in very well. The public information letters that I sent out before my arrival are starting to tally-up in the islanders’ minds, with the strange late-twenties gentleman who keeps cycling around the island; saying hello to everyone and asking what they think of the place. There is a strong drinking and dancing culture on Eigg that anyone who has joined the community in the last thirty years has taken on as their own. It’s a great way to meet people and ask them questions. But personally I find it hard to see straight, let alone think straight when I’m nursing my fith red-can; so I’m trying to meet folks in other myriad ways. There is the inter-island games coming up on the 15th (all welcome!) this year hosted on Eigg, and I’ve put my name down to help with the preparations for the Eigg-n-spoon, the sack race, and the tug of war etc. It’s really nice that such things still happen. And ties in well with the pub-mumming play still planned for the 24th. I have long wondered if wider-reaching public art is a reaction to the death of many of these fetes and carnivals at the hands of the dreaded ‘Health n’ Safety’? Feeling positive about intereviews today. I need to get at least another twenty to create a really comprehensive audiowork from them in September. There are lots of people who are saying they will come and chat with me at somepoint after the games, and who don’t seem to need it explaining particularly so all the information I sent is getting through. I get a sense from people that either they’d be happy to to be interviewed, or that they never will! I also realised that I really need to get on with the swap shop this week and next if I want it done in time, and it’s going to be a really tricky piece to pull-off. I am really interested in the cultural influences that have helped to shape the contemporary island, so I am thinking of persuing the re-ordering of the swap shop to represent the place in the world each object was made. There are plenty of items that came from all over Europe from places that you wouldn’t expect, and obviously lots from China, Australia, USA. etc. There is a plastic flute/recorder from Italy, a teasppon rack from North America, plates from all over England and France, plastic wares from Czechoslovakia, and the books are even more ridiculously well travelled; for instance- there are are English language childrens books printed in Budhapest and Tokyo, and a London Guide Book, printed in Singapore!